I’m a pretty lucky dog. I’ve had a nice life with people who love me.I get to go to work with my Mom Person and play with kids. I have a lovely river not far outside my door. I have a full toy basket with LOTS of tennis balls and jars full of treats. I never have to stay out in the weather or miss meals. Life is pretty good. I hear a lot about homeless dogs and dogs who live in shelters. I worry about things like that. All dogs should have a family to love and take care of. I also hear stories about lucky dogs who find those loving families by pure chance. We read a book today about just such a dog. He not only found a great family full of love, he also found a job full of adventure and became famous along the way. He was very lucky! 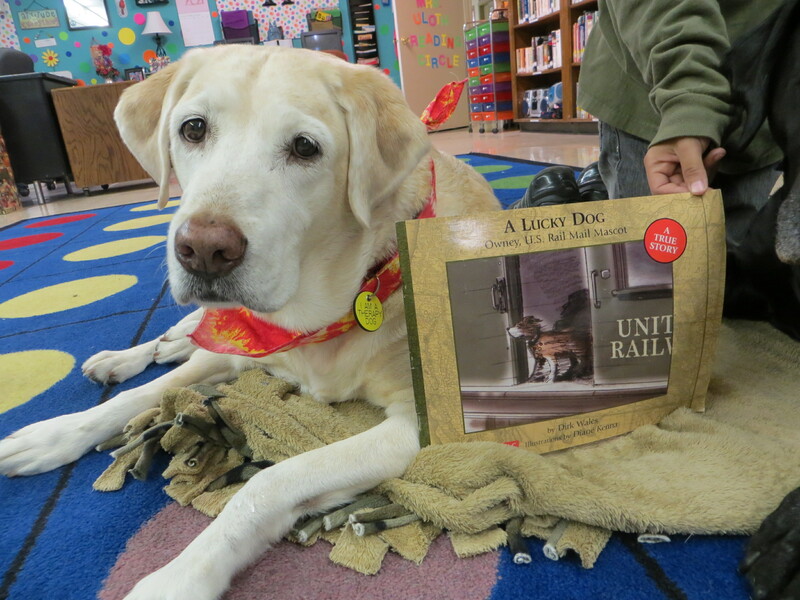 A LUCKY DOG, Owney, U.S. Rail Mail Mascot was written by Dirk Wales and illustrated by Diane Kenna. I couldn’t find much information about either Mr Wales or Ms Kenna. I did find an interesting interview with Mr Wales that you can watch HERE. 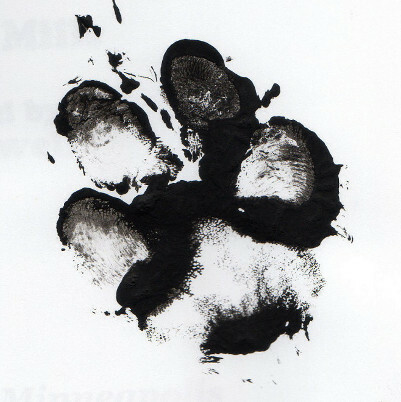 A Lucky Dog was originally published in 2003 by Great Plains Press. Our book was published in 2006 by Scholastic. That would be a homeless little dog in Albany, New York in 1889 who was lucky to find an open door into a dry, warm post office with nice, soft mail bags to curl up on. Then he was lucky to be found by a nice young postal worker named Owen who had a nice supervisor who let the dog stay. They all called the dog Owney because he was Owen’s dog. Owney became the Post Office mascot and got to go wherever the workers went. Even on the rail cars that carried the mail across the country! Owney was lucky to be able to travel all over the country and eventually around the world with the mail! At all the places he stopped on his travels he received a bagging tag and acquired so many that they had to make a special coat for him to hold them all. Ms Kenna’s illustrations are quite nice. Simple with a lot of emotion. They make you feel like you’re riding the rails with Owney! We had a fun time reading this book. 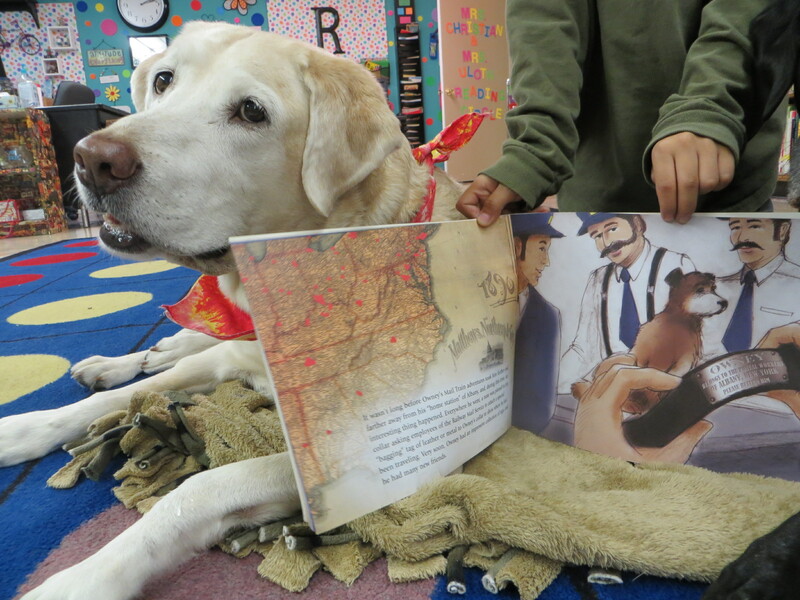 The kids all agreed that Owney was indeed a very lucky dog! They had never ridden on a train before. Lucky Owney! The book has a railroad map from 1890 that was pretty cool to look at. We couldn’t find Glen Rose – the words are VERY tiny, but it showed that Owney stopped at a few places in Texas. It would be interesting to have a bigger discussion about some of the places that Owney travelled along with the mail. If you happen to be lucky enough to live near Washington DC or lucky to travel there, you could visit the National Postal Museum and see Owney himself, stuffed and wearing all his tags. You can click here and learn more. The Postal Museum has actually created a curriculum guide for teachers. You can find that HERE. Today is Perfect Picture Book Friday and there are a lot of great picture books to be found at Susanna Hill’s blog. You might want to check it out! You might get lucky! I hope you have a lucky day today! I have a day off and will be taking it easy! This entry was posted in children's books, dog books, reading dogs, working dogs and tagged Diane Kenna, Dirk Wales, Owney, Postal Service, reading dogs, working dogs by readingwithrhythm. Bookmark the permalink. Owney is a very lucky dog. All of us with forever people are lucky. Plus he rode on trains!! Fun! Yes, indeed, Cupcake!! Have you ever been on a train? I have – but I didn’t get to hang out the windows and doors like Owney does in the book! The train was a nice place for a nap. With all the rules and regs, I wonder if the Post Office would allow this now. I would like to think so but know I’m probably wrong. Great choice of book! It doesn’t seem as thought dogs are this welcome in a lot of places anymore. That’s a sad thing. But there are dogs in libraries! And cats. So maybe there could still be a post office mascot?! I live about an hour away from Washing ton DC and often go to the museums there so I will be sure and look up Owney at the National Postal Museum. I’ll love to see his coat with all his tags. You live right there and have never see Owney?! You must get there and check him out. I would like to see him in person. But I guess I will have to content myself with pictures. His is a great story. I’ll put it on my “To Do List”. It does sound like a great story and one I want to see in person. What an adventurer! Lucky dog! Lucky dog, indeed! I’ve been on some adventures, but nothing like Owney’s! 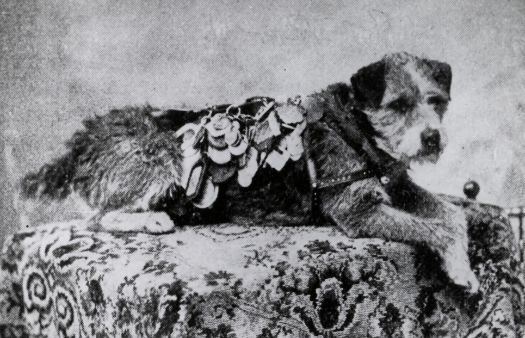 What a heartwarming story about Owney. I had never hear his story before. Love it that he became the mascot at the post office. Love true stories. He sure was lucky to find the post office and just the right workers who fell in love with him. He must have been a really special pup!! That’s a lovely story, Rhythm. I hope he got to take that heavy coat off to roll in the grass sometimes. Whew! Don’t you know it!! He sure had a lot of medals!! I remember reading about this dog a few years ago. . .a real live account! Rhythm, you are blessed. . . I do feel like I’m blessed. I am thankful for all of my blessings. And I like to hear stories of other lucky dogs. That’s a very honorable thing to do Erik! My Mom Person always wishes that she could adopt all of the senior dogs. 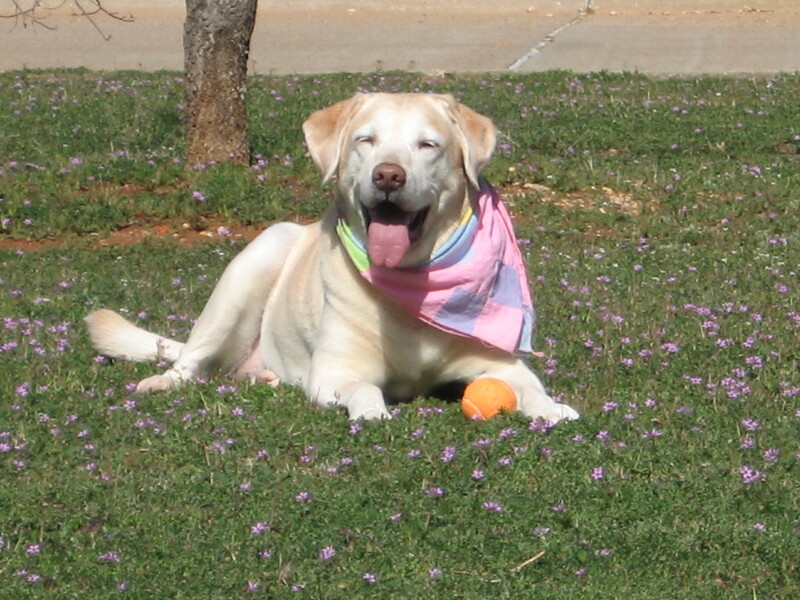 I hear that there are rescue shelters just for senior dogs. There are sure a lot of thoughtful, good people out there. And you are surely one of them Erik!! Rhythm, thank you so much for introducing us to Owney, what a terrific story he has! Owney’s story sure is book worthy incredible! Me too, Me too!! I think that there are several Owney books out there. You should have done one — I suspect you would have found some interesting twist to add. I guess it’s never too late! This reminds me of the true story of a girl that traveled by mail train to visit relatives. She was mailed! Mailing May, I think? In the fuzzy recesses of my brain, there seems to be some recollection of that book. I think it was a good one! I wonder if they still have mail trains? 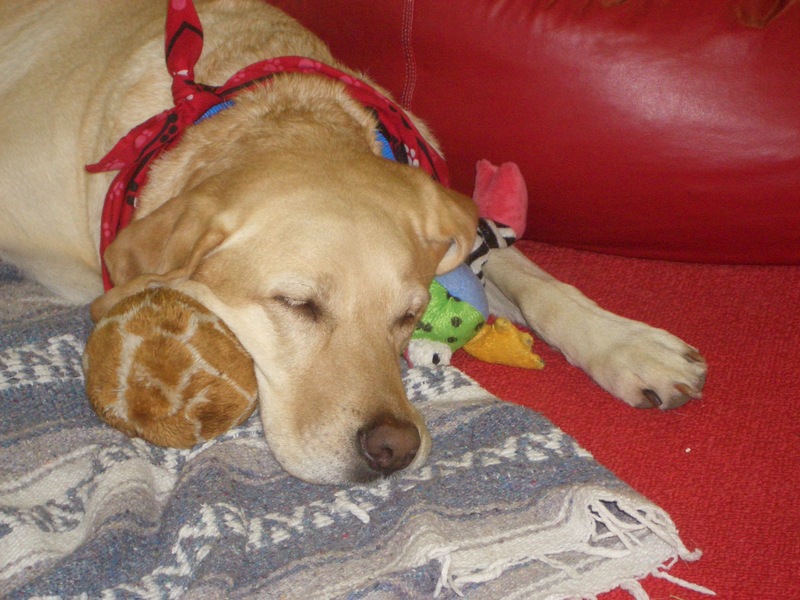 What an amazing story, and what a lucky dog indeed! Thank you for telling us about Owney, Rhythm. You’re most welcome! It was my lucky pleasure to discover Owney’s story and share it! Dogs AND trains. This book looks like a double win. We saw a mail car at the California Railway Museum in Sacrament. They are pretty amazing. The kids spent lots of time there. Double win indeed! Do your kids write letters to anyone? I like getting mail. I love our postal lady. She always has treats for us. I wonder if mail still goes by train? My kids do write letters sometimes — mostly to Santa or thank you notes. We are working on a host of thank you notes right now. Wow! I almost skipped this review. I seem to be way behind because it’s hard to find good computer help these days, and I’m enjoying pushing that delete button!! Lucky sure was a lucky dog. So much was different back then. I doubt the post office would have a live mascot making the rounds anywhere. You know I love dog rescues and Lucky would have been very welcome at the one I help. Hahaha! You’re so funny! I’m a lucky dog to have you for a friend!! Thanks for the curriculum guide and the link to the interview. It is so important to learn about a book’s creators as well as the heroes they write about. I love finding all the back stories. They open up whole new vistas and sometimes bring a new perspective to the book. That is a lucky dog to travel with the mail. yes, indeed! I travel with our mail to the mailbox, but never on a train!